He is also the leading grassroots advocate and spokesman for The State Of Jefferson. "In an average year, California gets enough snow and rain to put 200 million acres under a foot of water, but environmental opposition to dams over the last several decades has allowed the majority of the freshwater to flow into the ocean, even as the state's population exploded to nearly 40 million people. The current drought has left farms parched and residents under strict water consumption orders, but some say it didn't have to be that way. "This is a man-made disaster," said Bonner Cohen, senior fellow with the National Center for Public Policy Research. 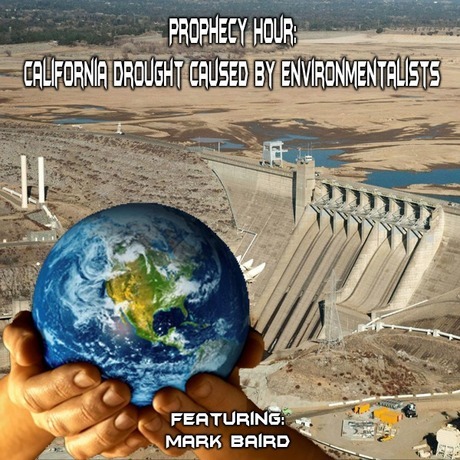 "Southern California is an arid part of the world where droughts -- even severe droughts -- are commonplace, and knowing this, you'd think the government of California would have included this mathematical certainty in its disaster preparedness planning, but the government has done nothing, not even store rain, as the population has continued to grow." Gov. Jerry Brown last week mandated the state's residents cut water usage by as much as 35 percent, saying, "As Californians, we have to pull together and save water in every way we can." Consumers face stiff penalties, forced installation of water restriction devices and even water service suspension if they don't comply with county mandates. Commercial users face even tougher sanctions, with one county requiring them to cut usage by 80 percent. The critics say California gets plenty of water to meet its needs, if it were only managed properly. More than half of California's surface water flows from the Sierra Nevada mountains in the east down to the Sacramento-San Joaquin Delta in Northern California. Much of the mountain runoff is managed by two of the world's largest water storage and transport systems – the federal Central Valley Project and California's State Water Project. Each is a system of dams, reservoirs and distribution systems designed to send water to cities, towns and farms throughout the state. But the vast majority of the state's 1,400 dams and reservoirs, in the two massive systems and smaller ones that supply southern California, were built well before the 1980s. Environmentalists have since stopped the construction of water storage and delivery systems through legal and political actions. They have also fought to ensure that captured water is released into streams and the ocean -- rather than the water delivery system -- in order to boost fish populations and dilute the salinity of the delta."